Club Penguin Cheats by Mimo777 Club Penguin Cheats by Mimo777: Club Penguin Rockhopper's Yarr Is Missing! Rockhopper said Yarr has run off, but, he is not too worried! He would like all penguins to help him look for Yarr around the island. He says it will be the "greatest hide-and-seek game ever!" There have been reports from construction penguins that they have seen puffles hiding in the Underground Caves! These caves should be reopening soon! Do you think that will be the new game and we will find Yarr there? Kinda sounds like it. 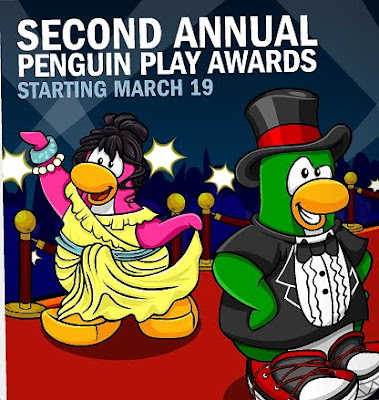 Woot, the Penguin Play Awards will be here March 19th! Get out your favorite formal wear! I would love to hear your new game theories! Ok Awesome love the post mimo u rock! maybe Yarr also hide inside the cave! ;) i think maybe theres a new game for members... maybe some new puffle games! Whoa! Yarr is gone again!? I know! On my website, I predicted that the game would be Puffle Rescue! ps. I voted for poem #6. I think yarr went missing in the cave! I hope that means Rockhopper will come to different servers and rooms more often and also New background hopefully! We might need to go to rockhopper island to find that puffle! COOL! It could be like a puffle round up ish game! I love hide and seek!!!! finally a new game!!!! i hope they find yarr though. Wow! I think there will be a "Find Yarr Hunt" Haha, sounds cool, huh? Oh, I just remembered it! New game comes with Rockhopper! =O Hide and Seek game coming? Maybe! Cant wait! He will be docking in a few days. maybe the brown puffle is in the cave? I do think that it's a Finding Yarr Game. Maybe he hid in the cave! Remember what Rory said,"We were 83% sure that it's Yarr or any other puffle." But how can they go in the cave if it's not even opening? He also said that he thought(well at least is what I thought)he said he saw a furry creacher. Actually, the first time he was gone, he wasn't actually gone. He was just with Rockhopper. But this time, he actually is gone. U have a cool life, ure whole family support ure blog, u get to meet Billybob anytime u like, u get stuff from cp! maybe just maybe in the new game we will find brown puffles and every brown puffle we find we can adopt thats my theory..
Mimo a long time ago i told club penguin that they should make a new game with Yarr In it! Yay! ..maybe herbert captured Yarr? or was yarr playin' around? like alot of ppl have said, i think herbert took yarr, and as far as seein puffles in the cave, maybe herbert is goin through with his previous plan of using puffles for sumthin, and hes keeping them there. Maybe the new pin is the Penguin Pet Awards trophy. This is for all the people who think Herbert took Yarr. Yes, I think your right, no I think your not right. If its yes, then how did Herbert take Yarr so fast? Rockhopper only came today. Hmmmm, thats what makes me say no. I also have another theory, Herbert is trying to steal the puffle in the cave!Guess we'll have to wait and see! My theory is that the new mission, the undergroud cave, and Yarr missing are all connected! I have the pieces but dont know where they fit! I think Herbert (who even said that his next plan would involve puffles)attracted the puffles to a cave to possibly fand the real Golden Puffle! I think herbert kidnapped him! remember herberts plans is about puffles? Mimo does have a cool life but he can't meet billybob anytime he wants. I think that Herbert stole Yarr -- remember he was planning something about puffles? Maybe Yarr was abducted by an giant UFO?